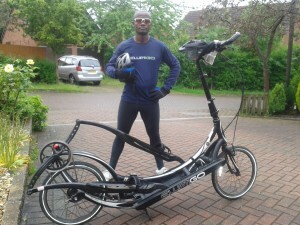 How do you use the ElliptiGO to Lose Weight? The Skinny Chef Gets GOing! Tips to Avoid Cold Hands and Feet on Long Bike Rides? What to Carry on a Long-Distance Audax Ride. 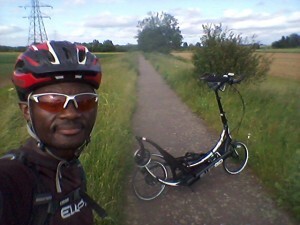 Don’t Yet Own An ElliptiGO? The second and third weeks of June 2014 saw good training progress for me as we got to within a fortnight of the start of Mille Cymru Audax challenge. In that period Alan, Stu, and I held our final planning meeting in which we unanimously agreed that each ElliptiGO rider in our 3-man Mille Cymru ElliptiGO ‘team’ would have to ride his own ride at the Mille Cymru event because we’d all prepared so differently that it had naturally fallen into place that we’d need to use separate strategies. Stuart was simply too quick for Alan and I – and it did not make sense to ‘waste’ that pace by riding as a trio. Alan and I appeared to be pretty similar in pace by this stage, but Alan had planned and trained for a riding strategy incorporating regular stops (for snacks and to rest his feet), whilst I’d gone in the complete opposite direction and trained myself to ride without eating at all – specifically to enable me to cut out (or shorten) stops and to save time in that way. After 6 months of preparation it had seemed easier for us all to stick with the mindset we’d developed over all those months of training. Despite this, we’d all planned to start out together and play it by ear from there. If, after a whole day of riding in the Mille Cymru event, any of us would still be together then logic would suggest that a more concerted group effort would need to be continued from that point onwards. But if not, then we’d each face it alone (and hopefully leave post-it notes for each other at the controls)! 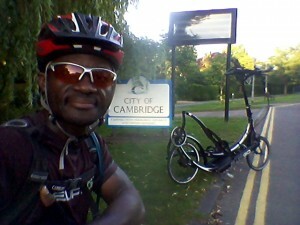 By this point I had ridden 16 consecutive weekend long rides of more than 100-miles in distance, the most recent being a 108-mile ride from Milton Keynes to Cambridge and back again – done overnight, so that I had finished at 1am! That ride was good night riding practice for me. I was still doing my high intensity sessions in this period – my 10 hill sprints and my 50-mile time trials. But I had gradually started to taper my general training mileages in June, from the time I had done the very testing Chiltern 100 sportive with Alan, Carl and Stu at the beginning of the month. I had also done some experimentation with my carbohydrate loading strategies and on 7 June I had done my long ride without my usual carb-loading after my 50-mile time-trial ride on the previous day. Despite feeling relatively good on that long ride I had noticed a drop in average pace of between 1-2 miles per hour on that out-and-back route to Leicester and that had shown me just how important it is to load carbohydrates correctly before my long rides and to refuel correctly after every ride. This timing of nutritional intake and carb-loading would be crucial for my success on the Mille Cymru ride and I realised I would need to carb-load correctly and also to time my recovery meals correctly, before each of my sleep stops. Those sleep stops would be the only opportunities for me to eat during the 75-hour Mille Cymru ride and the plan would be to eat big once each day, before each daily 3-hour sleep break. I’d trained for 6 months to be able to do this, so I might as well make the most of that training and to fully test out the process in the field. 18 June: Mid-week hill session. 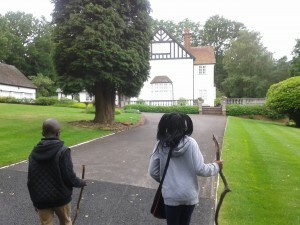 19 June: Final kick-boxing and weight training session. 20 June: Friday 50-mile time-trial. 22 June: Final Sunday long ride at slow pace (to drain the muscles of carbs and commence my final week of carb-loading before the event). 25 June: Wednesday active rest 30-minute ride. 27 June: Friday – Mille Cymru Audax – 620-miles, 53,000 feet of climbing, 75 hours time-limit. Idai Makaya (Copyright 2006-2018) All Rights Reserved.